The original Franciscan mission, Nuestra Señora de la Concepción del Socorro, was founded in 1682 by the Franciscan order, to serve displaced American Indians (the Piro, Tano and Jemez) from New Mexico, who fled during the Pueblo Revolt. 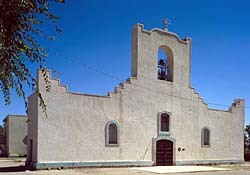 The present Socorro Mission was constructed c.1840 to replace an earlier 18th-century mission destroyed in 1829 by flooding of the Rio Grande. 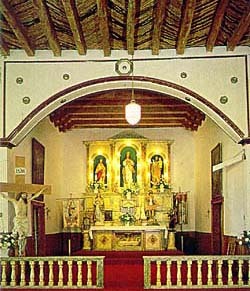 The mission, constructed of adobe surfaced with stucco, is particularly notable for its interior. The finely painted and decorated beams, or vigas, are from the 18th-century mission and were reused when the present church was constructed. The massing, details and use of decorative elements of the Socorro Mission show strong relationships to the building traditions of 17th-century Spanish New Mexico. The Socorro Mission is located at 328 S. Nevarez Rd. south of El Paso on I-10 at Moon Rd. and FM 258. It is open to the public Monday-Friday, 8:00am to 4:00pm. Call 915-859-7718 for further information. The Socorro Mission is part of the El Camino Real de Tierra Adentro National Historic Trail. The Socorro Mission has also been documented by the Historic American Buildings Survey. The Socorro Mission is featured in the National Park Service El Camino Real de Tierra Adentro National Historic Trail Travel Itinerary.